After buying tickets to the D-Backs Social Media night for Friday, I won tickets to the Arizona Lottery Fan Appreciation Day Neon Party for that same night. Luckily the there wasn't any scheduling conflicts. The Social Media stuff was pregame and the party took place during. The party was held in the Miller Light Diamond Club which is past the bleachers in right field. Daniel from It's Like Having My Own Card Shop was there too. It's always good to be able to catch up with him. Our prize package included $20 in D-Bucks that could be spent at the Team Shop, two neon green D-Backs t-shirts, and a pair of Arizona Lottery sunglasses. Those were great but the highlight of the party was a meet and greet with D-Backs alumni, Doug Davis and Augie Ojeda. Both players were great. 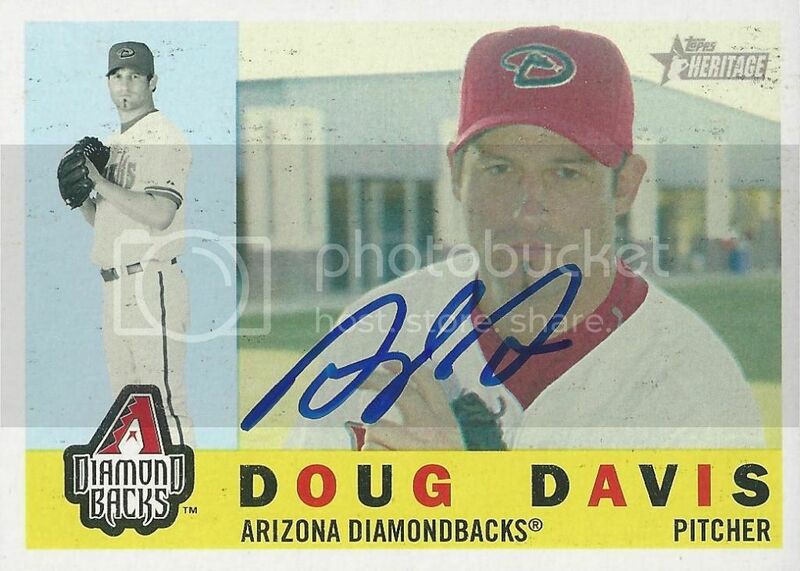 Doug Davis signed his 2009 Topps Heritage card for us.